I guess I would argue that Maslow’s Hierarchy of Needs, if it is used in terms of Positive Psychology, is culturally inadequate. 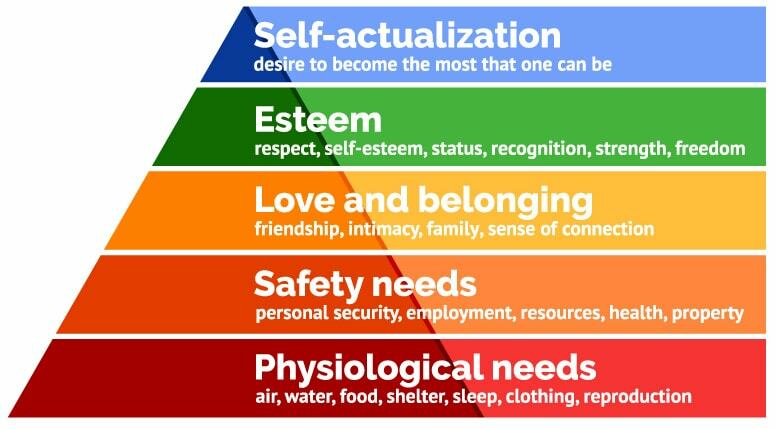 Taking into account culture and individuality could lead one to showing the hierarchy of needs as an upside-down pyramid. As humans, our physiological needs are quite similar. There is relatively little variation due to individuality or culture. However, when we move to Safety and Security, we start to have a broader range of attitudes and responses as to what meets this need. This is even more true when we get to Love and Belongingness. Culture defines social belongingness. What meets this need is far from universal. Continuing on to Esteem, it was already pretty broad as described by Maslow with social and individual components. Some derive esteem more from belongingness, others from public recognition, and yet others from internal resources or from God. This then leads to the broadest of all— actualization. It could be described as self-actualization, but studies have shown that most people feel that they are self-actualized if they are recognized as great or important by the general public. One might simply tell these people that they don’t understand what “self-actualized” really is. However, in the previous post, I related the story of a person who felt actualized by achieving his role as a positive member of a supportive family. It is hard to see how such actualization is less meaningful than achieving one’s own internal potential. Personal recognition of living out one’s personal talents and giftings. The Eastern mindset may focus more on the first one, while the Western mindset may focus more on the last one. As Christians we may focus on the second one. However, these are often more theoretical than actual. The most common one worldwide tends to be the third one— accolades of the public. That is quite likely the worst of the possible choices. To give over one’s evaluation of self-worth and achievement of purpose to a bunch of fickle strangers is truly self-destructive. Overall, however, I think it is worth noting that the church may fit better into the Eastern worldview in terms of social actualization, mixed with the second one. While a lot has been written about how Christians can achieve their God-given dreams, actualizing their calling and gifting, much of the Biblical understanding of the church is in terms of social actualization. It is not about you or me or about your dreams or my dreams, but our place as members of one body, carrying out our social roles within a community structured more on love and belongingness than on merit and success. And yes, it is also about God. This does not discount the other side, but I would suggest that far too many churches are filled with far too many disconnected and lonely people (“… where do they all come from.”). Perhaps it is time to consider a different model for church life and individual growth.